We specialize in producing metal bed, bed frame, shelf and a series of more family necessary set. We pay great attention to every detail of the products, including production, testing, packing and etc. so as to secure every product to be durable and breathable. We design high-quality products for major retailers from all over the world and famous home furnishing product brands. Please follow the instruction manual to install the bed. Or you can download the electronic manual if needed. If any questions, please feel free to contact HomeRecommend team by email HomeRecommend@hotmail.com immediately. MANUFACTURER GUARANTEE - HomeRecomend bed frame platform, directly from a SGS and ISO9001 certified manufacturer with much OEM brand experience, provides 5 years warranty with quality problem under normal use and eligible for free replacement parts. DURABLE SLATS WITH STORAGE SPACE - The queen bed smartbase features heavy duty steel cross bars, support legs and modern finish, approx. 79.92"*60" (L*W), standing 14" off the floor for under-bed storage space. SOLID SUPPORT FOR HEAVY PEOPLE - The mattress foundation weighs 57lb, very stable and sturdy for average weight people with a max support around 660-770lb lasting years of use. EASY TO ASSEMBLE - The box spring replacement comes in strong package, easy to assemble with all parts included and no extra tools needed. Fasten all the screws finally before getting all the parts in place so that the hole can line up and easy to screw. 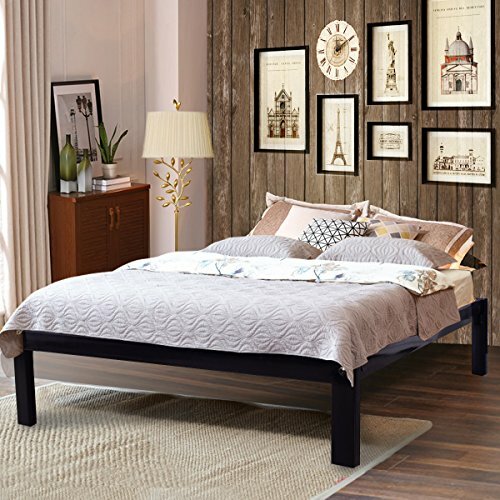 NO QUAKING & SCRATCHING - HomeRecommend standard bed frame can replace or accommodate any box spring without noise so that your family can get a better night sleep without tossing and turning. If you have any questions about this product by HomeRecommend, contact us by completing and submitting the form below. If you are looking for a specif part number, please include it with your message.